Characterized by its versatile zoom range and bright design, the Nikon F-mount 17-50mm f/2.8 EX DC OS HSM from Sigma covers a wide-angle to portrait-length range and features a constant f/2.8 maximum aperture to excel in available light conditions. The optical design incorporates a pair of low dispersion elements along with a trio of aspherical elements to reduce a variety of aberrations and promote greater sharpness and clarity. A Super Multi-Layer Coating is also used to suppress flare and ghosting for improved contrast and color accuracy. Benefitting the optics, a Hyper Sonic Motor affords quick and quiet autofocus performance while an Optical Stabilizer minimizes the appearance of camera shake for sharper handheld shooting. Additionally, the lens is distinguished by its sleek profile, making it an ideal lens for walkaround and travel shooting. Standard zoom lens is designed for DX-format Nikon F-mount cameras and provides a 25.5-75mm equivalent focal length range. Constant f/2.8 maximum aperture is well-suited for working in low-light conditions and also provides greater control over the focus position when using shallow depth of field techniques. Two F Low Dispersion (FLD) elements are featured in the optical design, and help to reduce color fringing and chromatic aberrations for improved clarity and color accuracy. Three aspherical elements are used to help limit distortion and spherical aberrations and also contribute to greater overall sharpness and accurate rendering. Super Multi-Layer Coating has been applied to individual elements to minimize flare and ghosting for improved contrast and color accuracy when working in strong lighting conditions. Hyper Sonic Motor (HSM), along with an internal focusing design, realizes quick and quiet autofocus performance as well as full-time manual focus override. Minimum focusing distance of 11" and a 1:5 maximum magnification ratio benefits working with close-up subjects. Optical Stabilizer system minimizes the appearance of camera shake to benefit making sharper imagery when shooting handheld. 17-50mm f/2.8 EX DC OS HSM Lens for Nikon F is rated 4.5 out of 5 by 331. Rated 5 out of 5 by Lyle M. from One of the best upgrades from a kit lens I use this lens for low light photography indoors and outdoors. As well as night photography, and walk around photography. It has a great zoom range, and is very diverse. This lens and the Sigma 8-16mm make a great pair.Compared to a kit lens, this Sigma has better image quality in low light, better ISO performance, and much faster auto focus. Also. the OS (Vibration Reduction), is very effective, and makes a huge difference in slow shutter speed and low light.The BAD: no 6 year warranty like Tamron.Not so BAD: it's compact but heavy.The Sigma 17-50mm f/2.8 is an upgrade for those who want to unleash the greater potential of their Nikon D3200 that are limited by the kit lens. Rated 3 out of 5 by seafoodbuffet from Great if you get a good copy From reading reviews, you'll get the sense that this is a solid lens. My own impressions were that it's sharp, even wide open, and works well throughout the zoom and aperture range. It's shockingly heavy for such a short zoom but not to the point of annoyance. The biggest failing is that there seems to be a lot of variation between copies.Mine, though sharp, had more than ten visible liquid spots behind the front element which were obvious when set to a small aperture (I tested on f22). The look kinda like sensor dust spots but immediately disappeared when I switched lenses. I'm holding my breath on a replacement copy but make sure you test your copy as soon as you receive. Rated 5 out of 5 by Scott Michaels from Amazing Bargain Like most people looking for a fast mid-range zoom I considered the significantly more expensive Nikon 17-55mm. What finally convinced me to buy the Sigma were several on-line reviews where it performed as well as or better in several categories than the Nikon. Its performance has lived up to its reviews for me -- fast focus, sharp centers at all ranges and apertures even wide open, reproduces colors accurately, and the image stabilization (OS) works very well. On the downside, edges wide open could have been sharper, the zoom ring turns in the opposite direction than Nikon lenses, and in order to adjust focus manually you must switch to manual focus. Rated 5 out of 5 by DnD Photography&Design from A wonderful lens at 1/2 the Nikon price I have been a Nikon shooter for over 20 years. I've owned most of their fixed and variable focal length lenses. As a previous owner of the 24-70mm F2.8, I was skeptical about the quality of this lens. But after reading the reviews I decided to give it a try. Let me tell you, it is awesome! The sharpness throughout the focal range is sharp, and the contrast of the lens is great. The mounting was a little stiff at first, but it has smoothed out with a few lens changes. I'm a purist when it comes to my photography, but, not so much when it comes to equipment. Give me a better price for an equivalent quality product and I'll buy it. Rated 5 out of 5 by MaryG from A Winner! Been saving for the infamous Nikon 24-70mm 2.4 lens for a long time, but still couldn't justify dropping a small fortune on it. Found many positive reviews on this lens and with the DX crop factor of my Nikon D90 decided to take a chance on it. So glad I did! The build quality is better than I expected and the optic quality is even better than some of my Nikon lenses. And it cost a fraction of the price of the Nikon 24-70mm and 17-55mm F2.8. If you are hesitant to buy this lens in lieu of the Nikon Go for it! you won't be disappointed. Check out the Flickr Group dedicated to this lens and you will see the results first hand. Rated 5 out of 5 by Daniel from A solid 3rd party lens I gave this lens as a gift with the Nikon D7100. It is such a great camera/lens combination. Light, sharp, quick to focus. The camera needed no adjusting in the auto focus fine tuning system. I really don't like purchasing third party lenses and I was nervous about this purchase as well. But Nikon just doesn't offer an equivalent. The OS works well but subject movement doesn't always let you take full advantage of it. Yet I consider the OS a big plus. I'm really glad I gave this lens (and D7100) to my brother. He let me shoot with it and it was so much fun and gave excellent images. Rated 2 out of 5 by Thomas from Optics = Pass? but Mechanics = Fail Although almost all my Nikon D7200 lenses are now primes, I started with zooms. As an old-time professional film (mid-1950s) photographer, I accepted the need for "walk around zoom lenses for street photography. I have always preferred to zoom with my feet, but now that I'm 80 I decided to get a walk around zoom. Unfortunately, this particular lens has 2 big deficiencies; short focus adjustment rotation in manual mode (about 1/4 turn), and a VERY stiff zoom control. Neither is conducive to the rapid response needed for street photography. Thanks to B&H's policies I returned it for EGC, so I can pursue other options. Rated 5 out of 5 by Anonymous from Great Optics, Great Lens! For those who shy away from 3rd party lenses because you are brand loyal, you are missing out. I have used the Nikkor 17-55 extensively and find this to be just as sharp and exhibit as good optics. Add on stabilization and smaller size and I actually prefer this over the Nikkor at a much lower price. The only thing the Nikon 17-55 has over this lens is slightly faster focus (Slightly) - Other than that, I prefer this Sigma. An amazing little lens on a D7000. The resolving power is something else. Might need to stop down to f/4 or so at 17mm but beyond 20mm it is amazingly sharp even wide open. Well worth the money for me so far. Have not been disappointed at all. I do have a Panasonic Lumix that has a M4/3 mount. I have a Metabones 0.71 which I use for Rokinons and Nikon F mount lenses. 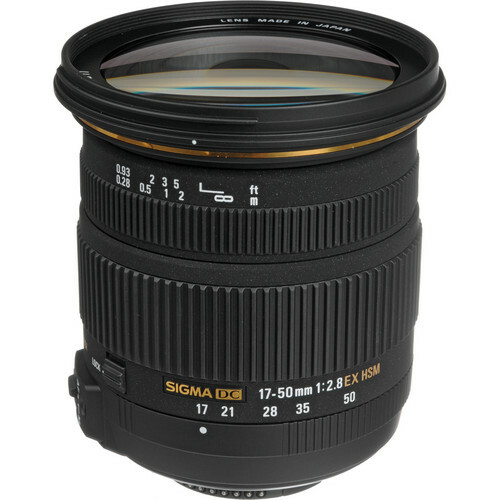 I need to know if it is compatible with this Sigma 17-50mm and if I will be able take advantage of all the features this lens comes with?Thanks! It will work technically but the speed booster will give you some vignetting at the wider angle. Does this lens work on the D7000, including auto-focus? Yes, the Sigma 17-50mm f/2.8 lens is compatible with the Nikon D7000, including autofocus. While there is a bit broader of a focal length with the 17-70mm f/2.8-4 http://bhpho.to/Uj7qj6 compared to the 17-50mm, the 17-50mm varies in quality due to there being a constant f/2.8 aperture. The constant f/2.8 aperture even at the longest focal length of 50mm will allow you to keep your lens wide open and is a faster lens overall, especially in low light. Does this lens work with the Nikon D40x? Yes this Sigma 17-50mm f/2.8 EX DC OS HSM Zoom Lens for Nikon DSLRs with APS-C Sensors will be compatible with the Nikon D40x DSLR camera. hi. do i still need to update the firmware to get fully functional with the nikon 7200 ? how do i update the firmware ? This lens is fully compatible with the Nikon D7200. I don't have time to wade through tons of reviews, so...Is there anyone who has reviewed this lens using a D90 (don't have money to upgrade right now and need a fast lens). I will be using it for portraits, low light events, weddings, etc. I use this as the primary lens on my D90. I love it! It is great in low light situations; with the optical stabilization activated I can hand hold at 1/15 or slower and get clean pictures. The fixed aperture is nice and bright in almost all shooting situations. The zoom range works really well for about 85% of the shooting that I do. I agree with the other post that this is a very nice lens for portraits. Does this lens work with D3100? Yes, the Sigma 17-50mm f/2.8 is compatible with the Nikon D3100. Does the lens zoom action work reverse of most Nikon lenses. The product picture suggests that this is the case. The zoom ring would turn to the left to adjust for the focal lengths.